epexegesis: "It is on record that this was literally fulfilled"
"It is on record that this was literally fulfilled"
As I mentioned in the previous post, St. Thomas Aquinas was commissioned to write a commentary on the four Gospels for Pope Urban IV, collected from Christian commentaries distributed over a thousand years of history. That commentary, consisting of many ancient fragments, is now called the Catena Aurea. In this post, I'm going to highlight many more of those comments which Aquinas selected because they all play an important role in this series I've been writing about. Today I want to cover the views of one particular person. He is another "Doctor of the Church", and is considered by the Church to be "the Father of English History." 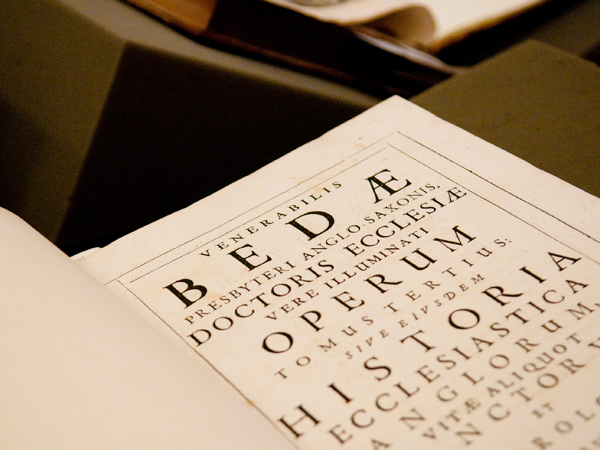 The Church calls him Saint Bede or the "Venerable Bede" (672-735 A.D.). ...Hitherto our Lord had been speaking of those things which were to come to pass for forty years, the end not yet coming. He now describes the very end itself of the desolation, which was accomplished by the Roman army; as it is said, And when ye shall see Jerusalem compassed, &c. ...But how, while the city was already compassed with an army, were they to depart out? except that the preceding word “then” is to be referred, not to the actual time of the siege, but the period just before, when first the armed soldiers began to disperse themselves through the parts of Galilee and Samaria. ...For many came forward, when destruction was hanging over Jerusalem, saying that they were Christs, and that the time of freedom was now approaching. Many teachers of heresy also arose in the Church even in the time of the Apostles; and many Antichrists came in the name of Christ, the first of whom was Simon Magus, to whom the Samaritans, as we read in the Acts of the Apostles, listened, saying, This man is the great power of God: wherefore also it is added here, And shall deceive many. (Acts 8:10) Now from the time of the Passion of our Lord there ceased not amongst the Jewish people, who chose the seditious robber and rejected Christ the Saviour, either external wars or civil discord; wherefore it goes on: And when ye shall hear of wars and rumours of wars, be ye not troubled. And when these come, the Apostles are warned not to be afraid, or to leave Jerusalem and Judæa, because the end was not to come at once, nay was to be put off for forty years.4 And this is what is added: for such things must needs be; but the end shall not be yet, that is, the desolation of the province, and the last destruction of the city and temple. It goes on: For nation shall rise against nation, and kingdom against kingdom. ...The Lord shews how Jerusalem and the province of Judæa merited the infliction of such calamities, in the following words: But take heed to yourselves: for they shall deliver you up to councils; and in the synagogues ye shall be beaten. For the greatest cause of destruction to the Jewish people was, that after slaying the Saviour, they also tormented the heralds of His name and faith with wicked cruelty. ...When we are challenged to understand what is said (about the "Abomination of Desolation"), we may conclude that it is mystical. But it may either be said simply of Antichrist, or of the statue of Cæsar, which Pilate put into the temple, or of the equestrian statue of Adrian, which for a long time stood in the holy of holies itself. An idol is also called abomination according to the Old Testament, and he has added of desolation, because it was placed in the temple when desolate and deserted. 1. Thomas Aquinas. (1843). Catena Aurea: Commentary on the Four Gospels, Collected out of the Works of the Fathers: St. Luke. (J. H. Newman, Ed.) (Vol. 3, p. 674). Oxford: John Henry Parker. 4. i.e. in 70 A.D., forty years after Jesus' death in 30 A.D.
5. Thomas Aquinas. (1842). Catena Aurea: Commentary on the Four Gospels, Collected out of the Works of the Fathers: St. Mark. (J. H. Newman, Ed.) (Vol. 2, pp. 256–257). Oxford: John Henry Parker.